This is a beautiful Brass Whist Marker inset with an ivory pointing hand, it is the Long Whist Type with marks 0-9. In exceptional antique condition, it is marked to the face for Perry & Co of London - with the appropriate 1860 Registered design mark to the base, it is a superb piece in the best of order - sure to delight!. Beautiful! 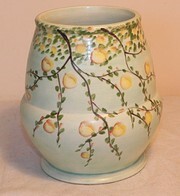 This is fine example of an original hand painted Edward Radford Vase, wonderful pattern. It stands c. 4.5" inch tall, dates c. 1920-30 and has an early E Radford Burslem backstamp and signature. The pale green glaze is in good order showing only minor signs of crazing commensurate with age. No damage, this little beauty will not disappoint. This beautiful, ladies calling card case is made of a deep, rich coloured tortoise shell, dating to the late 1800/early 1900's it is exceptionally well crafted with individual pieces perfectly set with pewter insers. The clasp and hinge pins are in good order, opening to reveal a nice clean interior. The only thing worthy of note is a tiny surface scuff (see supersized pic) which neither detracts nor threatens integrity in any way - this is a quality piece. Please call or email for further pictures or information on this special piece.